This page describes organizations that are connected to our congregation in some meaningful way. Erb Street is a member of Mennonite Church Canada and gives significant financial support to this national body. It is one of our major ways of supporting Ontario and World missions. 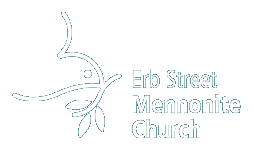 Erb Street is a member of Mennonite Church Eastern Canada (MCEC) and gives significant financial support to this local body. It is one of the ways we support leadership and Christian development within the wider church. MCEC attempts to make disciples, grow congregations and form leaders. The church provides bursaries to students from the congregation who attend Rockway Mennonite Collegiate. As a Christian educational community within the Anabaptist Mennonite tradition, Rockway Mennonite Collegiate integrates sound academic learning with growth in character and faith, together with a passion for peacemaking and service to God and all creation. The church has been home to many Conrad Grebel University College students over the years, and hopes to be home to many more. Please come and join us. A number of our members are associated with the college in various ways. The Canadian Mennonite magazine is provided free to all regular church attendees and members. Canadian Mennonite is a bi-weekly Mennonite/Anabaptist magazine which seeks to promote covenantal relationships within the Mennonite Church Canada constituency. Mennonite Central Committee (MCC) and Mennonite Central Committee Ontario (MCCO) are both supported by the church in various ways, from direct donations to church representatives to running a booth at the New Hamburg Mennonite Relief Sale each year. Mennonite Economic Development Agency (MEDA) is supported in a number of ways, including volunteers and financially. At the moment we even have a number of congregants who work there. As an association of Christians, in business and the professions, committed to applying biblical teachings in the marketplace, MEDA members share their faith, abilities and resources to address human needs through economic development. Shalom Counselling Services is supported by the church in a number of ways. Shalom actually rents a church building and the church donates a portion of the rent. We have members on the board and staff at Shalom and share a close relationship. Shalom is a professional community counselling agency in Waterloo, Ontario – part of the network of counselling agencies in Waterloo Region. Shalom is a faith-based organization that provides counselling services to people from all walks of life, backgrounds and belief systems. Shalom makes counselling affordable and accessible with fees that are calculated on a sliding scale according to family income. House of Friendship is supported by the church with direct donations and representation on the board. House of Friendship is a charitable social service agency that annually serves over 42,000 women, men, youth and children living on low income. Our program areas focus on: Supporting Healthy Lives (Addiction Services); Feeding and Assisting Those In Need (Community Services); Building Strong Families and Strong Communities (Family Services);and, Providing Shelter and Supportive Housing (Residential Services). Supportive Housing Of Waterloo (SHOW) is supported by Community garden space and food, volunteers and board representation. SHOW’s mission is to collaboratively provide housing and a continuum of supports to those who have experienced homelessness and encountered barriers to achieve their fundamental right to safe and affordable housing. Mennonite Disaster Service is supported financially and with volunteers and board representation. Mennonite Coalition for Refugee Support (MCRS) is supported by the church with donations and representation. MCRS’ mission is to create a more just, welcoming, and supportive environment for refugee claimants in our community through the provision of orientation and advocacy throughout the refugee claim process, settlement support, and through the building of a community of mutual support. New Hamburg Mennonite Relief Sale (NHMRS) is supported by our volunteers in a few ways, but mainly by running a food booth at the sale. The Relief Sale was started in 1967 by individuals from Mennonite churches in southwestern-Ontario in response to the ever-growing world-wide need for relief from hunger, poverty and natural disaster and for development and peace-building activities. All merchandise and services are donated which means all funds raised on sale days are donated directly to Mennonite Central Committee (MCC), a not-for-profit relief, service and development and peace agency of the Mennonite and Brethren in Christ churches in North America. YWCA Emergency Shelter Services (formerly Mary’s Place) is supported financially and with volunteer efforts. YWCA Emergency Shelter Services (YWCA ESS) is a 60-bed emergency shelter for women (16 and older), transgendered people, and families who are experiencing homelessness. Parents of either gender with children who are homeless are welcome to stay. Homelessness is the only criterion for residence. YWCA ESS provides an important safety net to ensure that families, women and transgendered persons have immediate access to shelter, food and other basic necessities of life in emergencies, when their personal resources and supports are unable to sustain them in housing. Addressing the complex needs of those experiencing homelessness using an anti-oppression/anti-racist, trauma informed and client centred approach in a non-judgemental supportive environment. Providing advocacy, information and referral to longer term community supports and services which can assist with their future self sufficiency. Underhill Residence is our next door neighbour. They are supported possibly most visibly by the monthly delivery of birthday cakes, which we understand are most appreciated. The Underhill Residence is a residential option for Adults or those with mental health concerns. Basic residential support, 24 hour staff, all meals and snacks included, housekeeping and laundry, minimal counselling support provided and personal care. The Mennonite Story interpretive centre gives a multi-media overview of Mennonite History. As a Mennonite church and heritage, we support them both financially and emotionally.